It's the newest and most popular Giants hangout in the Bay Area, and it has your name all over it! This fantastically clever San Francisco Giants Personalized MLB Pub Sign decor features a "sign of a sign" and is fully customizable — just tell us what name or nickname you prefer on the marquee. 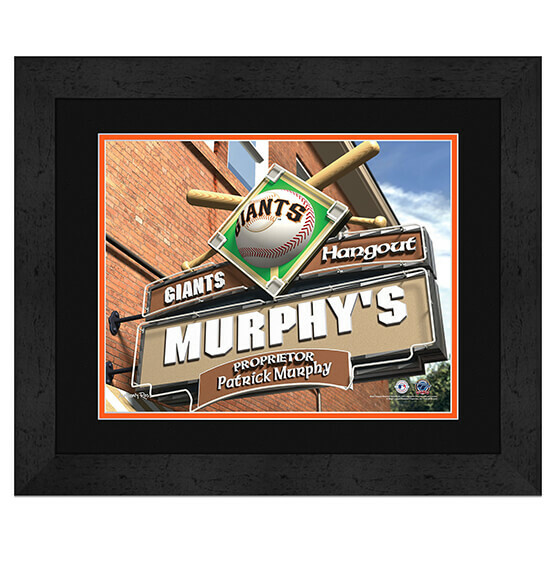 Featuring signature San Francisco Giants colors and logos, this is one sports decor piece that is a must-have for your office, home or Giants fan zone. High-quality glass, MDF vinyl-wrapped frame and a convenient sawtooth hanger makes this a fantastic addition to any room. This piece is a great gift for die-hard fans of the Bay Bombers.